I sat in on a life coaching class a few months back. As we wrote down words on the board to solidify our feelings I was asked if I was resonating with these words. If like the mothers and wives, I fit in. At a young age we are told to do great things, be great things, live great things. In contrast we are warned that great things come with time, realistic thought, and hard work. To achieve greatness we must first fail. As an eager beaver intern for a local news station in my college town I pulled on my most appropriate “camera ready” outfit and trotted off to destiny. My life was always meant to serve a purpose, that I was sure. What better way to do it than by the eyes of millions. Or what would one day be millions, when I took over as head anchor on a national channel. Or got my own talk show. Whichever came first. I remember racing home with fingers crossed hoping the Red Socks would win the baseball world series. If they won, my package was going to air. A mere intern getting a spot on the 9 o’clock news. And there I sat, watching my frightened face peer out of the screen as I became a reporter! I remember thinking, there can be no feeling in the world better than this of starting my dream. Failure isn’t always bad. But bad always feels like failure. Though, as the months went on it wasn’t all sunshine and Red Socks wins. I became the failure. I was writing stories left and right, stacking shows all by myself, cutting video and finding video, filming video on cameras I was not legally allowed to hold. And with all this hard work, I was always wrong. Always being yelled at for bad stories and blurry footage, yet always being asked to come in when someone was sick. Working 60 hour weeks but being told I wasn’t good enough to be an actual reporter. My name became Bailey, a girl they hired to a position I was promised. Yes, this is correct. My boss not once questioned why he was now calling the girl who worked there for a year and a half a name that was not hers. Or why there were two Bailey’s on staff, wearing different outfits, at the same time… I was living failure. And one day, as I sat at the desk I claimed when no one was looking, we heard the screams from his office. Of course it was me. And of course I spelled something wrong. I got that screeching note at least once a week. In one swift motion he shuffled out of his room on tottering legs, snagged a big red dictionary, the kind your mom uses to decorate but no one ever opens, and slammed it on my desk with a pudgy finger release. What? No words could be said. No thoughts were being processed. With trembling lips I flipped page after page, my long fought battle with dyslexia creeping up on me. Rushing back came the memories of elementary school when I feared pop corn reading and buddy time because I could not make out the words on child book pages. All the years of bad grades due to mixed up letters and triple spell check swarming in around me. Chocking me. Holding me down to this now very small office. It felt like hours. It felt like days. As the word I no longer remember, finally uncovered itself. A quick glimpse in his direction showed that everyone in the entire office was now focused on me. Focused on the mess of tears and shaking body as I read. Letter by letter. The word that masked my failure. And then, he was gone. Gone into his office where the problem would most likely never cross his mind again. And I was left to decide, do I fight failure? Or do I let it fight me one more time? But I can say it taught me. That experience is why I am here today. Why I want to show people they can chase their dreams, and defeat failure. We have got to learn to stand up for ourselves, even in a world where unpaid internships and being immersed in our work is the norm. I hold great esteem for those who know their dreams and chase them. Fight for your dreams and love what you do. But don’t let people steal your life, or make you feel like misery. 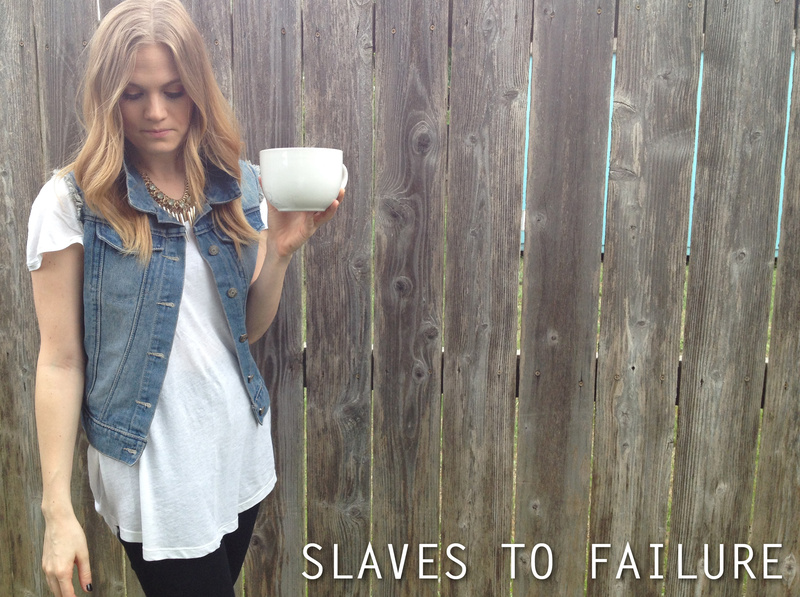 Don’t ever be a slave to failure.